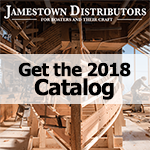 Jamestown Distributors carries a full line of U-Bolts in different materials. Stainless and galvanized steel provide corrosion resistance in and around salt water. U-Bolts can be used for a number of fastening projects, including attaching trailer parts to the trailer frame. Shipshape, SeaChoice, and Tie Down Marine all make U-Bolts that work with their component trailer brackets, rollers, bunks, springs, axles, and other trailer accessories. We carry a variety of U bolts in marine grades for varying needs. Each type of U bolt has different dimensions and intended uses. Transom eyes- We carry Perko stainless steel transom eyes that include plate, nuts, and washers. Use for towing or lashing eye. Bow Eyes- Made of stainless steel, includes nuts and washers for mounting. Round Bow Eyes feature a 1 inch diameter eye, and are available in chrome plated or polished bronze.